Adams said diversity and equity are important not just for upward social mobility and building generational wealth on a personal level, but to maintain the nation‘s global competitiveness, a theme echoed by U.S. Rep. Raul Grijalva, D-Az., in his keynote remarks. Community colleges are playing an increasingly pivotal role in expanding the pipeline toward tech industry diversity, NACCE president and CEO Dr. Rebecca Corbin said in a fireside chat with Rose Stuckey Kirk, Verizon’s chief corporate social responsibility officer. 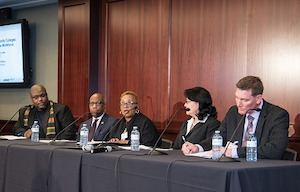 Tech companies must be committed to going beyond their conventional recruiting practices at predominantly White institutions, said Morgan State University president Dr. David Wilson during a panel discussion about HBCUs. And that goes beyond bias training and tokenism, Tamez said during a panel discussion about recruiting, developing and supporting diverse workers, innovators and entrepreneurs. She said the tech industry has received a diversity “wake-up call,” and more companies should follow the lead of companies such as Intel in achieving employment equity. Fractured efforts involving institutions, business, government and other stakeholders need to become more cooperative, she said.